As the 2013 season begins, we’re visiting three destinations that are each hosting special events this summer. Whether you want to set a course for new cruising grounds on your own boat or explore them aboard a charter yacht, Mystic,CT, Solomons,MD and Casco Bay,ME are beckoning. 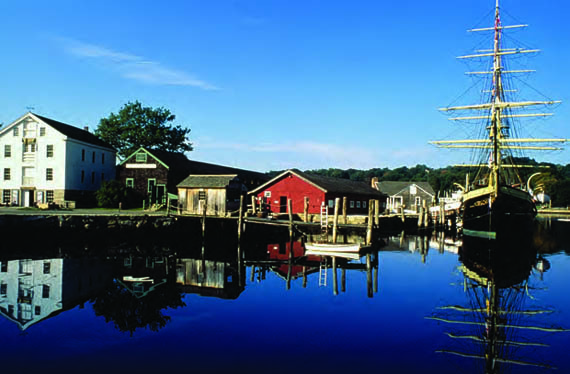 With an historic seaport and a world-class aquarium, Mystic has been Connecticut’s most popular summer destination for a long time. Now there’s another reason to set a course for this shoreline town, with the First Annual Mystic Blues Festival coming on the weekend of June 28 – 30. The festival kicks off with a fireworks display over the Mystic River on Friday night and continues with a powerhouse lineup that is, quite literally, a Who’s Who of the blues. The festival’s Grand Marshall,James “Superharp” Cotton, has won several W. C. Handy Blues Awards and shared the stage with Muddy Waters, B.B. King and Johnny Winter, to name just a few. Keyboard wizard Al Kooper, a founding member of Blood, Sweat & Tears, was onstage when Bob Dylan “went electric” in Newport, and recorded the million-sellingSuper Session with Mike Bloomfield and Stephen Stills. Other national acts include Connecticut’s own Christine Ohlman & Rebel Montez. Ohlman, known as “The Beehive Queen” for her towering blonde hairdo, is the longtime vocalist for the Saturday Night Live Band who has performed or recorded with Ian Hunter, Ry Cooder, Marshall Crenshaw, Amy Rigby and many others. 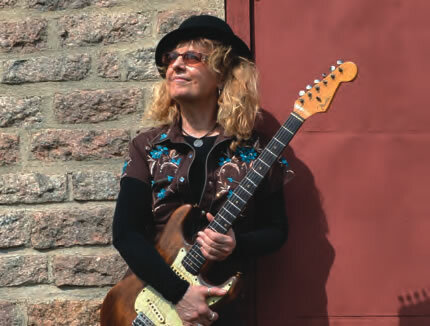 Another Connecticut artist, guitar slinger and vocalist Debbie Davies was a member of Albert Collins’ Icebreakers before launching a successful solo career. Jaimoe’s Jasssz Band is led by drummer Jaimoe Johanson, a founding member of the Allman Brothers Band.James Montgomery, dubbed “the John Mayall of New England” by former J. Geils frontman Peter Wolf, is one of the greatest blues harp players. Guitarist and vocalist Ricky “King” Russell is the recipient of an honorary “Doctorate of the Blues” from Harvard. His band, The Cadillac Horns, will feature special guests Matt “Guitar” Murphy, who has played with everyone from Howlin’ Wolf to The Blues Brothers, and harpmaster Jerry Portnoy, who’s performed with Muddy Waters and Eric Clapton and co-founded The Legendary Blues Band. Kal David/Jeff Pevar & the Joint Venture is fronted by a pair of incendiary guitarists and vocalist Lauri Bono. A founding member of The Fabulous Rhinestones, Kal David was a longtime lead guitarist with John Mayall’s Bluesbreakers. Pevar’s credits includes stints with Ray Charles, Jimmy Webb and Joe Cocker. Jim Weider’s ProJECT PERCoLAToR is led by a master of the Telecaster who has performed or recorded with The Band, Los Lobos, Taj Mahal and many others. Rhode Island’s own Roomful of Blues, who are celebrating their 45th anniversary, will be performing at the Sunday Blues Brunch at Mystic Shipyard. Opening acts will include critically acclaimed regional blues musicians, as well as emerging talent, performing at an assortment of both ticketed and free venues. Performances are scheduled at a variety of different-sized venues. Ticketed venues include the main stage at Mystic Shipyard, the Olde Mistick Village Art Cinemas, the historic Knickerbocker Café in Westerly, RI, and the Grand Ballroom of the Mystic Marriott Hotel. Tickets for the Mystic Marriott concert include admission to a Music Expo showcasing local and regional music retailers, services and vendors. Bars and restaurants, including The Octagon at the Mystic Marriott, Voodoo Grill, La Luna, The Steak Loft and Go Fish, will host blues artists all weekend. John Belushi once said, “I suggest you buy as many blues records as you can.” We suggest you catch the first thing smokin’ for the Mystic Blues Festival…and bring the family! For a list of performers and the schedule, visit mysticbluesfestival.com and facebook.com/MysticBluesFestival. Securely berthed on a tee-head in Solomons, MD, you savor a mug of fresh-brewed coffee in the cockpit of your well-appointed bareboat charter yacht. 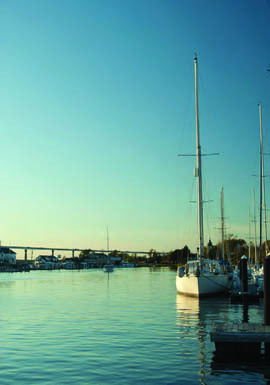 You relax in the sunny warmth while you plan your day’s sail on the Chesapeake Bay. Suddenly, a blast of music breaks your reverie, and you watch as a hundred race boats parade past – battle flags flying – headed for the Patuxent River. It’s Screwpile in Solomons! The Screwpile Lighthouse Challenge is a regional sailboat regatta, drawing over 120 boats each year from across the country. The event features three days of round-the-buoys racing and three nights of rip-roaring parties. A point-to-point race from Annapolis to Solomons on Friday night, July 19 brings many contenders to town. After a Saturday of rest, relaxation and rum, this year’s Screwpile begins on Sunday, July 21 and ends on Tuesday, July 23. One-design and PHRF classes sail three races per day on courses set at the mouth of the Patuxent. Each morning features a 9 am Harbor Start parade, and camaraderie prevails at the post-race parties at the waterfront Solomons Holiday Inn. 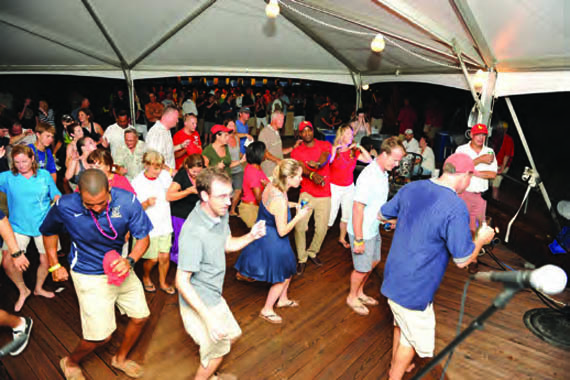 Screwpile has been a Solomons institution since 1993, when the Southern Maryland Sailing Association (SMSA) took over the efforts of the (departed) Yachting Magazine Race Week. The regatta is named for the screwpile-style lighthouse that once guarded the mouth of the Patuxent at Drum Point that now stands proudly at the Calvert Marine Museum. Whether you’re racing Screwpile, cruising the Bay or exploring by car, Solomons is a fabulous place to visit. This historic maritime community was recently named one of America’s “15 Happiest Seaside Towns” by Coastal Living Magazine, and deservedly so. Located just 50 miles south of Annapolis, Solomons is an easy reach for cruisers and bareboat charterers. Several full-service marinas cater to visiting boaters, offering secure berths, hot showers, restaurants, swimming pools, bicycles and marine services. You’ll also find a sailing school and bareboat charter base, as well as fishing tours. Rent a kayak or SUP to explore the harbor from a new perspective. For those who prefer seclusion, snug anchorages are available in Solomons harbor and surrounding creeks. Solomons has a number of hotels and gracious B&Bs for those not staying onboard. Most marinas are an easy walk or bike ride from town, which boasts a wealth of activities for visitors. At the Calvert Marine Museum, visitors can explore how the prehistoric past, natural environment and maritime heritage blend to tell a unique story of the Chesapeake. Climb through the Drum Point “Screwpile” lighthouse, watch the sea otters at play, and enjoy a river cruise on a historic oyster “buy-boat.” CMM’s waterside concerts include classic favorites like Bad Company and ZZ Top. Annmarie Sculpture Garden and Arts Center is an oasis for the art lovers. Weave your way along the wooded walking path and feast your eyes on sculpture, including many on loan from the Smithsonian Institution and National Gallery of Art. The ship-inspired Arts Building includes rotating exhibition space, so each visit is a new adventure. Solomons is home to the University of Maryland’s Chesapeake Biological Laboratory, where visitors can learn about the natural environment of the Chesapeake Bay. CBL’s location at the mouth of the harbor makes it a perfect spot to watch the Screwpile Harbor-Start parade and returning racers. Savor fresh local seafood at one of the many Solomons waterfront restaurants. Stroll along the Riverwalk and enjoy the fabulous view of the Patuxent River. Shoppers will appreciate the galleries, antiques, gift shops and boutiques in the heart of town. A spa treatment is just the thing after a hard day of sailing (or shopping). Wander along the waterfront to the world-famous Tiki Bar! Their legendary Mai Tais are sure to put you in an island state of mind. For more than three decades, Maine sailors have been marking their calendars for a special mid-August weekend. Year after year boats turn out from every area fleet — from one-design racers to PHRF cruisers and custom boats — to spend a day sailing around the islands in Casco Bay. Perhaps what makes this weekend so popular is more than a sailboat race; it’s the opportunity to support an important cause in a very public and impactful way. 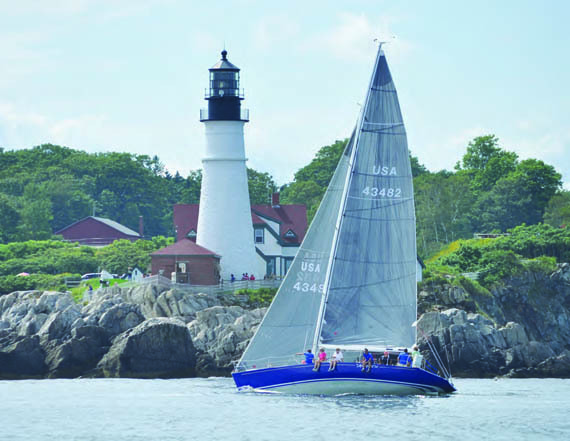 The MS Regatta is scheduled this summer for August 17 as part of the MS Harborfest Weekend, Friday through Sunday, August 16-18 in Casco Bay. 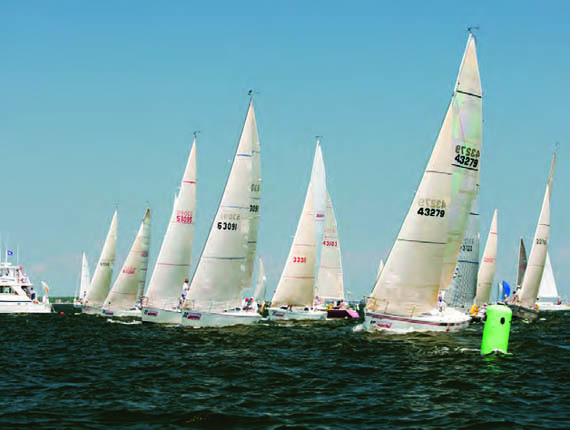 The MS Regatta is one of the biggest races of the season, sometimes attracting a fleet of well over 100. The proceeds generated from the regatta are all donated to The Portland Chapter of the National MS Society to drive research for a cure to Multiple Sclerosis and to address the challenges of everyone affected by MS. The event, which is now the largest and longest-running charity sailing event in New England, was started in 1982 by a small group of sailors from Falmouth, Maine. While originally their intent was to keep out-of-town sailors around after their annual trip to Maine for the well-attended Monhegan Regatta, the idea shifted to a fundraising event. At the time, Multiple Sclerosis wasn’t well understood and there was no known cure, yet it was debilitating to those affected. Regatta organizers decided to support research for a cure by raising money through raffle giveaways and soliciting sponsorship for each boat from local companies. The MS Regatta was a hit immediately. In its early years, it quickly grew in size and sponsorship so the event was generating a considerable amount of money annually for its namesake cause. Over the decades, organizers added a silent auction, a live auction, and a dinner to the event. Ten years ago, tugboats from up and down the coast of Maine got involved by holding a muster the day after the regatta. Ultimately, landlubbers who watched the parade of sail and tugboat muster from Portland’s Easter promenade wanted to get more involved in the popular event. 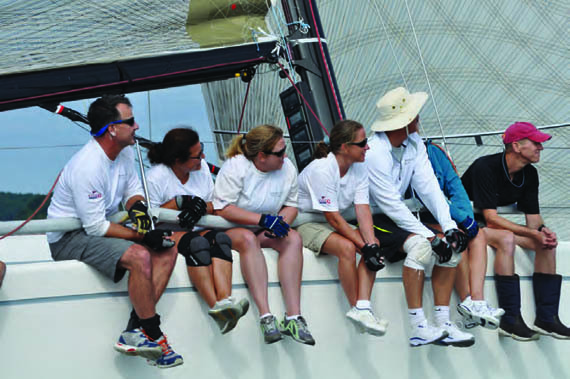 By 2004, the MS Regatta evolved to the MS Harborfest, a weekend-long fundraiser and celebration. The MS Harborfest Weekend now kicks off with the MS Benefit Auction and MS Regatta skippers’ meeting on Friday night. Saturday is a day for anyone who wants to be on the water — sailors continue to race in the MS Regatta and powerboaters have the opportunity to participate in the MS Powerboat Poker Run. Finally on Sunday, crowds of people gather along Portland and South Portland’s shores to watch the MS Tugboat Muster and, most recently, lobster boat races. There are also shoreside events at the Maine State pier on Sunday, and a 5K run in Portland’s Fort Allen Park. The MS Regatta continues to be a focal point of the MS Harborfest Weekend. The course hasn’t changed much over the years, so all the sailors know what to expect: It’s a challenging journey from Portland Harbor, southeast to scenic Portland Headlight; back past Cushing Island, Fort Gorges, Little Diamond Island and Great Diamond Island into the waters off Falmouth; and then back into Portland Harbor for the finish. There are multiple points of sail, allowing plenty of opportunities for the racing classes to fly their chutes on nice long reaches. The cruising classes often pack their boats with family and friends for a picturesque day on the water in Maine. The MS Regatta always has more room for racers, cruisers and even multihulls. It’s a feel-good weekend for a worthy cause that offers opportunities for the whole family to get involved. Registration for the 2013 MS Harborfest will open soon, and more information is online nationalmssociety.org. We hope this destination section has enticed you to start planning your summer adventure, whether with your own boat or chartering from an East Coast provider. Below are a summary of resources in this issue to check in with.